I haven't drawn a knot in years, but today it seemed like the thing to do. 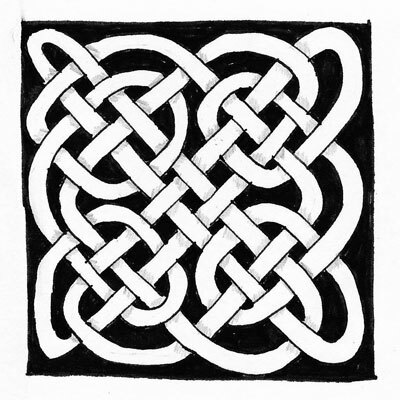 I had to go back to my reference book (Celtic Design: Knotwork by Aiden Meehan) to remind myself how the knot was supposed to wind itself around the guiding grid. This knot is done on a grid done by Mr. Meehan, so while I've drawn this one, it's copied from one of his designs. Maybe there will be more knots (of the artistic variety) this year? Ooh, ooh, love Celtic knotwork. Beautiful knot you've made there. I did some of the applique version many moon ago with a friend; you absolutely could translate that design into fabric if you so desired. We made what seemed like MILES of bias for a full size quilt. It turned out really well.